1 Cor.15:45-47 And so it is written the first man Adam became a living being the last man Adam became a life giving spirit. However the spiritual is not first, but the natural, and afterward the spiritual. The first man was of the earth made of dust; the second man is the Lord from heaven. v.48 As was the man of dust, so also are those who are made of dust; and as is the heavenly Man, so also are those who are heavenly. And as we have borne the image of the man of dust, we shall also bear the image of the heavenly Man. Paul is showing a contrast of the first Adam who was a natural finite being made of earth and the 2nd Adam who represents the new humanity. Vs.47 he tells us the first man was of the earth, the 2nd is the Lord from heaven who came down to earth taking upon himself a human form. In vs.21 Paul writes since by man came death by a man came the resurrection from the dead. This is another contrast that what is from the earth goes back into the ground but the new man is brought into a permanent state not subject to the elements of nature. God created both the first and Last Adam had supernatural births. God created both Adam and Jesus directly with no procreative act. The first Adam was formed from the ground as a direct creation of God. The last Adam is formed in Mary's womb supernaturally. Both were created without sin, only one, the last Adam lived a sinless life to be able to redeem us from our sin. Speaking of Jesus Luke 3:22-23 And the Holy Spirit descended in bodily form like a dove upon Him, and a voice came from heaven which said, "You are My beloved Son; in You I am well pleased. "23 Now Jesus Himself began His ministry at about thirty years of age, being (as was supposed) the son of Joseph, the son of Heli. Here we see the proclamation of his being the Son by the father. Luke 3:36-38 the son of Cainan, the son of Arphaxad, the son of Shem, the son of Noah, the son of Lamech, the son of Methuselah, the son of Enoch, the son of Jared, the son of Mahalalel, the son of Cainan, the son of Enos, the son of Seth, the son of Adam, the Son of God. Here Luke traces Christ's genealogy back to Adam and then says the Son of God showing Adams origin, Christ being the source of his life. Gen. 5:1 "This is the book of the genealogy of Adam" In the day that God created man, He made him in the likeness of God." Mans genealogy begins with Adam who was supernaturally made, but in Luke's genealogy he goes back one more step to the Son of God. There is a revelation here that is often missed. Gen.1:1 says "In the beginning God created the heavens and the earth, Gen.1:26-27 says He made man in His image. Here we find the source is the Son of God, Christ who became the 2nd (last) Adam is the source of the first. Adam was the natural headship over the human race. Christ, the last Adam is the spiritual headship over the human race. By Adams sin death came to all people by Christ's death this penalty was reversed and eternal life in the body is given to all people who receive it by him. They are born again spiritually first and then they will be resurrected or transformed into a incorruptible body. This last Adam was promised after Adam sinned (Gen.3:15). In Lk.3:23 he traces the genealogy of Christ backward from Mary back to Adam. connecting Jesus as the seed of the women that would crush the serpents head Gen.3:15. Lk.1:30,35 The angel Gabriel announces to Mary, " that Holy one which shall be born of thee shall be called the Son of God." Rom. 5:14-19 "Nevertheless death reigned from Adam to Moses, even over those who had not sinned according to the likeness of the transgression of Adam, who is a type of Him who was to come. But the free gift is not like the offense. For if by the one man's offense many died, much more the grace of God and the gift by the grace of the one Man, Jesus Christ, abounded to man And the gift is not like that which came through the one who sinned. For the judgment which, came from one offense, resulted in condemnation, but the free gift which came from many offenses resulted in justification. For if by the one man's offense death reigned through the one, much more those who receive abundance of grace and of the gift of righteousness will reign in life through the One, Jesus Christ.) Therefore, as through one man's offense judgment came to all men, resulting in condemnation, even so through one Man's righteous act the free gift came to all men, resulting in justification of life. For as by one man's disobedience many were made sinners, so also by one Man's obedience many will be made righteous." Paul writes that in the first Adam we all sinned and died. That everyone who is descended from Adam has inherited this nature and penalty. Man now does not have the ability to choose contrary to his nature so God has to intervene. So he sent His spirit into the whole world to convict the world of sin, righteousness and judgment. He uses Adam as a type of him who is to come to reverse this effect, Christ By his obedience we were all made righteous. Both Adams were the federal heads of the human race the first Adam was the federal head of sin the last Adam of righteousness and life. The first brought sin and death the last was a life giving spirit to all who believed. 1 Cor.15:45 God sees only two men as the sources for the human race Adam and Jesus everyone is either part of the first Adam or the 2nd Adam. Both were created directly by God and without sin. Adams Nature is transferred by inheritance. In order to live forever we must be born of the 2nd Adam or we will die in our sins in our inherited nature from the first Adam. When God created Adam and Eve they were told only two commands to subdue the earth and not to eat of the tree in the middle of the garden. Gen. 2:16-17 And the LORD God commanded the man, saying, "Of every tree of the garden you may freely eat;17"but of the tree of the knowledge of good and evil you shall not eat, for in the day that you eat of it you shall surely die." it was after this command that the Lord put Adam to sleep and was to give him Eve his wife. Satan's nature is a seducer The Serpent ha Nachash was already in the garden this was a literal serpent that Satan used to carry out his temptation. The word for serpent in Hebrew is naschash it from another root word Nechoshet which means bronze. In Num. 21:9 God told Moses to make a bronze serpent Nachash Nechoshet are used. In 2 Kings 18:4 it is called Nechustan This makes the connection of bronze, in Genesis the serpent appeared as shiny and luminous just the same as Paul describes Satan in 2 Cor.11:14 an angel of light. We don�t have any record of the length of time that transpired between Gen. 2:25 and 3:1 so we can�t estimate how long they lived in the Garden until this event took place. Gen. 3:1-7 "Now the serpent was more cunning than any beast of the field which the LORD God had made." Satan comes softly and through the snake, he questions Eve by asking has God really said? Satan begins his attack by starting a debate as a theologian and he said to the woman, "Has God indeed said, 'You shall not eat of every tree of the garden'?" Interesting fact that this creature speaking to her did not shock Eve. Why? Could it be that Satan was counterfeiting the Lord as a glorious holy creature to instruct here as God did. 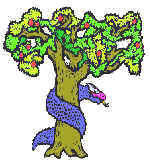 Eve responds by saying to the serpent, "We may eat the fruit of the trees of the garden v.3 "but of the fruit of the tree which is in the midst of the garden, God has said, 'You shall not eat it, nor shall you touch it, lest you die.'" Eve was aware of the prohibition God put on this one tree probably from her husband. The serpent responds to her repeat of the command that God gave Adam v.4 Then the serpent said to the woman, "You will not surely die." This is the first lie recorded in the Scripture and this is why Jesus attributes to Satan the title the father of lies (Jn.8:44) he is the source of all lying. He then moves to an affront to the truth of God. "For God knows that in the day you eat of it your eyes will be opened, and you will be like God, knowing good and evil." Satan's appeal was that the knowledge of good and evil is what makes God who He is. If she eats from this tree she too will have this knowledge and it will make her like God. The temptations bait was "to disobey would produce a greater good." It was just the opposite by knowing both good and evil they no longer could do the good. V.6 So when the woman saw that the tree was good for food, that it was pleasant to the eyes, and a tree desirable to make one wise, she took of its fruit and ate. She also gave to her husband with her, and he ate." One can only wonder where Adam was as all this was transpiring (one can only wonder where Adam was when all this was taking place, probably in a hammock?) V.7 Then the eyes of both of them were opened, and they knew that they were naked; and they sewed fig leaves together and made themselves coverings. You can cover up your sin with fig leaves but it can never remove it. Adam and Eve did what they thought was right, and sewed fig leaves. This is mans way of covering his guilt from the outside, but it does nothing for the inside. Today we do no better than Adam and Eve in covering our guilt. Every religion is based on the fig leaves mentality. Every religion tries to cover their sin their own way. but God saw this would not do and had to give them the covering of a slain animal. Satan's temptation was toward the self and not toward God. (1 John 2:15) Do not love the world, nor the things in the world. If anyone loves the world, the love of the Father is not in him. For all that is in the world, the lust of the flesh and the lust of the eyes and the boastful pride of life, is not from the Father but is from the world." Eves attention was drawn to the tree from an outside influenced. She saw it was: good for food - the lust of the flesh, a delight to the eyes the lust of the eyes, desirable to make one wise - the boastful pride of life. She coveted God's position. Adam and eve were operating by their spiritual nature prior to all of this but now they only had the flesh. What happened to them continues to happen to us today as there is an enemy that has us focus on the things of the world in an unhealthy way and exclude God. An innocent request became the catalyst for the most devastating repercussions mankind has ever known. They ended up doubting Gods warning and what transpired was way worse than the corruption and hatred we see in the world today, worse than the titanic disaster, worse than Hitler and all the wars, because it became the cause of all these, it changed man, his nature and the atmosphere of life, so that we are reaping all its effects even today. Illness, sickness and death became the outward result. But the greatest disease, the plague that has destroyed more lives than any other is the inward result. Sin became a foreign intrusion to our lives and environment. We received Spiritual death and became a slave to a fallen nature that was never intended to be our inheritance. Why so great a punishment for a slight disobedience, after all it was only their first time. God had made the command so simple, so clear, that there was no excuse. They were able to eat from all the trees except one. It was forbidden for their protection. This was not done under ignorance, they fully knew what the consequences would be, they were warned. This became a desire that birthed to know something God forbid them to know. They tried to become like God independent of God just as Satan did. In doing so, they became a law to themselves. The went the same way Satan did, focusing on themselves instead on God's instructions. What they desired was going to be given to them , but it had to be done God's way, in Gods time. Instead, motivated with sin it became a rush for the end product which God would only give by maturing them. If they had passed the test of obedience it would have confirmed their holiness and would have been passed down to their offspring. This is probably why they had no children until after the fall, God was waiting for the outcome of the testing. God's intention was for man to be like God in his nature by eating of the tree of life, which is representative of Christ. Mankind was to be reflective of the image of God, instead it became marred, Mankind has failed because of Adam but God has a solution, a remedy for the disease called sin. Adam and Eve were as little children innocent and young in that they needed to grow in knowledge and truth to be mature. They had no imperfections, but they were not perfected yet. The way to be perfected was to eat only from the tree of life and take on his nature and live forever. If they had passed the testing they would have had free access to the tree of life and been given eternal life. The first Adam fell. As a result, all the rest of us have been born with a fallen, Adamic nature - the nature of the flesh. That is why flesh and blood cannot inherit the kingdom of God (1 Corinthians 15:50). It is fallen it needs a transformation but we first need a spiritual rebirth. There had to be a second Adam to undo the mistake of the first Adam. And that is what God promised. Genesis 2:19 And out of the ground the Lord God formed every beast of the field and every,. bird of the sky, and brought them to the man to see what he would call them; and whatever the man called a living creature. that was its name' Here, in Genesis, Adam was alone with all the animals. Mark chapter 1 repaints the picture in Genesis. The first Adam was alone with the animals. Now the second Adam is alone with the animals. What happened with the first Adam? Along came the tempter to have him sin The lust of the flesh - good for food, the lust of the eyes - a delight to the eyes, the boastful pride of life - desirable to make one wise. What did Satan try on Jesus? The same thing he offered to the first Adam he does to the 2nd. Luke 4:2-3 being tempted for forty days by the devil. And in those days He ate nothing, and afterward, when they had ended, He was hungry. And the devil said to Him, "If You are the Son of God, command this stone to become bread." lust of the flesh- from what I understand there are certain stones in Israel that look like bread, these are probably what he used. As Eve and Adam saw that the tree was good food to eat , they ate of it. Jesus tempted the same way says man shall not live by bread alone but by every word that proceeds out of the mouth of God." He kept his eyes on the truth what is mans real source of life focusing on what his servanthood is about, doing Gods will before his own desire. So the first temptation did not work. Next the devil took him to the temple and next asked him to throw himself off the pinnacle of the temple to prove his trust in God by jumping. the pride of life-, he rebukes the devil by saying it is written you shall not tempt the Lord your God. The 2nd temptation did not work. Next the devil took him up to a high Mountain and then showed him all the kingdoms of the world offering them to him in exchange for worship. The lust of the eyes- Jesus again refers to the truth of the word "you shall worship the Lord your God and him only will you serve". The 3rd temptation failed also. Jesus successfully deterred Satan showing his sinlessness and that he truly is the Son of God. Jesus never question Satan's authority to give him these things. God first gave dominion over the earth to Adam but when he disobeyed God, and obeyed Satan the dominion of the earth was transferred into his hands. The first Adam became a sinner by sinning, after him the whole human race had no choice, it was passed on as our nature. Jesus as the 2nd Adam had the same choice to become just as we are by sinning but the second Adam did not give Place to the lust of the flesh, the lust of the eyes or the boastful pride of life. As God he perfectly ruled over his human nature. Satan�s objective was to have Jesus the 2nd Adam sin just as the first and disqualify him from his goal as the Messiah. God had a purpose also, the very reason Jesus was tempted was to prove he truly is the Son of God. The Devil knew this and challenged him on this position. God made a renewing of the covenant with Israel, this is called Deuteronomy the book of the law, this is the very book Jesus recites to Satan to ward off his attacks, he quotes Gods covenantal book to Israel standing on his word and promises. Jesus fulfilled the law perfectly in his life as he is the word, the book of life incarnate. In Lk.4 Jesus was filled with the Spirit and was lead into the wilderness by the spirit as a time of preparation. When he was tested he came out from the wilderness victorious in the power of the Spirit to perform miracles. The pattern is very much the same for us today, as we are tested and become victorious we will be filled and ready to go out in the power. Jesus needed to put himself through the same testing as Adam and Israel and eventually the cross. He needed to undo the damage that Adam did by being victorious in his testing. Only the last Adam could go to the cross to pay for our sins. The 2nd Adam came so the works of Satan would be destroyed this was met at the cross where in Col.1:15 it says he disarmed principalities and powers, he made a public spectacle of them triumphing over them in it. While Satan was unable to make Jesus sin he only alternative was to try to kill him. What looked like the ultimate victory actually became his downfall. The knowledge of good and evil is still with us today yet God says Rom.16:19-20 For your obedience has become known to all. Therefore I am glad on your behalf; but I want you to be wise in what is good, and simple concerning evil. And the God of peace will crush Satan under your feet shortly. The grace of our Lord Jesus Christ be with you. Amen. This all centers again around the tree, Peter uses the term of a tree instead of a cross taking the analogy back to Genesis. Pet. 2:24 who Himself bore our sins in His own body on the tree, that we, having died to sins, might live for righteousness-- by whose stripes you were healed. Acts 10:39"And we are witnesses of all things which He did both in the land of the Jews and in Jerusalem, whom they killed by hanging on a tree. Acts 13:29 "Now when they had fulfilled all that was written concerning Him, they took Him down from the tree and laid Him in a tomb. Around the first tree man sinned so he could no longer partake of the tree of life, death came to all. Around the 2nd tree Jesus conquered sin and forgiveness was made available to all. The curse began at the 1st tree and ended by the 2nd tree, as Jesus became a curse for us. The first Adam contradicted Gods command and went against his will the 2nd Adam humbled himself and only did Gods commands perfectly, obeying the fathers will. Where the first Adam failed with his test in the garden the last Adam succeeded his test in the Garden of Gethsemane by doing the fathers will. The first Adam sinned by a tree the last Adam reversed the first sin by hanging on a tree. Christ hung naked on the 2nd tree while at the 1st tree Adam and eve became aware they were naked and they felt shamed. Jesus had no shame because he had no sin. They stripped him and gambled for his garment. Adam needed to be clothed in a garment of animal skin. God made only one entrance one way to the tree of life but blocked it . While Jesus at the 2nd tree reversed it and opened the way for all. By the first tree man was punished by law for disobedience, by the 2nd tree Christ took on the punishment of the law so man can be accepted by grace. Paul writes in 2 Cor. 11:3 But I fear, lest somehow, as the serpent deceived Eve by his craftiness, so your minds may be corrupted from the simplicity that is in Christ." God has given a simple solution to counter all that is designed by the enemy to remove us from walking correctly, it is God himself, the Holy Spirit. Who do you want to be part of? The first Adam that is going to perish or do you want to be a part of the second Adam that is going experience God's love and His blessings forever by being in his presence? God kept Adam and Eve out of the Garden so they would not be able to eat of the tree of life, so they did not change into a permanent state of sin and pass it on to all others afterwards with no hope of change. God now offers all a new life through the 2nd Adam, our savior Jesus Christ. Does your life begin again with death of Jesus and continue on in eternity, or does it begin with the natural life only, if so, then it will end with death. Those who are born once will die twice, those who born twice will only die once. Christ offers the new birth to all, so no one will have to die spiritually, nor physically permanently. He offers a rebirth in Spirit for restoring our broken relationship with God because of sin and he offers a new body at the resurrection. In the recreation there is going to be only one tree, the tree of life (Rev.22:2) There is only one entrance back and it is to humble oneself, admit we are sinful and then we will be allowed to partake of the tree of life, only Christ can remove our sin. Until this occurs one will continue to bear fruit from the tree of knowledge of good and evil and be ashamed, trying to cover up their sin. The solution has been provided, the choice is yours, it's only a prayer away.